Boyd and Conners with the Columbia in Harbour Grace in September 1930. Parsons and Bowman 1983, 66. On September 28th  they [Captain Errol Boyd of the Royal Air Force and Lieutenant Harry P. Connor of the U.S. Naval Reserve in the monoplane The Columbia] flew low over St. John’s and dropped a message in a cigarette can. The message, addressed to J.M. Barbour, Superintendent of the Anglo-American telegraph company, was picked up by a young man named Kent who delivered it to Barbour. The message read: “Saying hello to everybody in St. John’s. Sorry we can’t land. Bet there are some beautiful girls there! Many thanks for your cooperation on this flight. Boyd and Connors” (65-6). 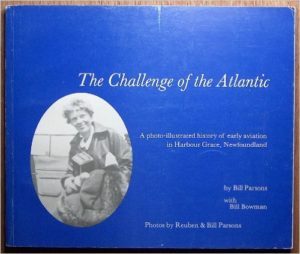 The most prominent thing about The Challenge of the Atlantic: A Photo-illustrated History of Early Aviation in Harbour Grace, Newfoundland by Bill Parsons and Bill Bowman are the beautiful pictures of Harbour Grace. After this, are the wonderfully personal stories associated with the history of the aircraft that stopped in Harbour Grace. The pictures were taken by Reuben and Bill Parsons, and between them, they captured some of the most important aviation moments in Harbour Grace’s history, and everyday life in the town. The pictures of Harbour Grace put the airfield within the context of the community; a town that is one of the oldest in Newfoundland, has a rich fishing, shipping and ship building history, and even served as the capitol of Newfoundland for a period. With such a varied history, it seems reasonable that Harbour Grace would expand their view and form the Harbour Grace Airport Trust Company in 1927. 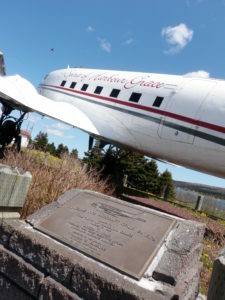 The Spirit of Harbour Grace aviation monument. Photo by author 2012. This DC-3 was the last one flown by Royal Cooper. 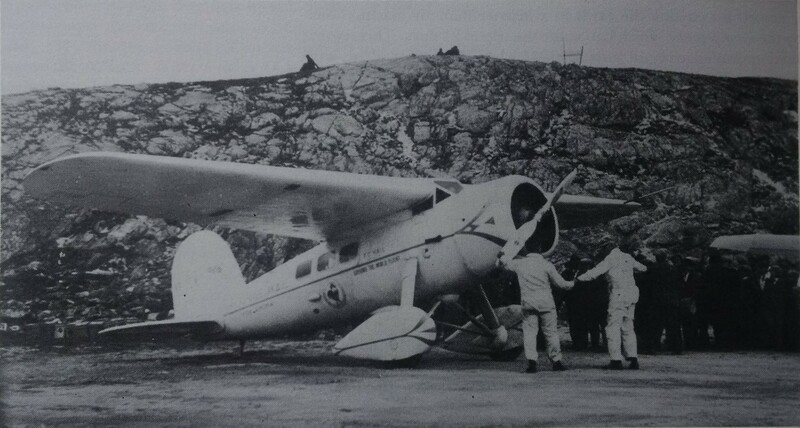 The interest in aviation was perhaps sparked by the Atlantic Air Race as one of the crews planning to attempt the crossing, lead by Rear Admiral Sir Mark Kerr, set up in Harbour Grace. The airstrip for the attempt was located where St. Francis High School now stands and ran parallel with Water Street, between the railway and the harbour. Kerr’s Handley Page Atlantic never attempted the crossing from Harbour Grace, but did make a test flight to St. John’s in 25 minutes. Before the attempt could be made, Alcock and Whitten-Brown made their successful crossing and the crew of the Handley Page decided to make an attempt from New York instead of Harbour Grace. It never made that attempt either. Harbour Grace Airfield. Photo by author 2010. 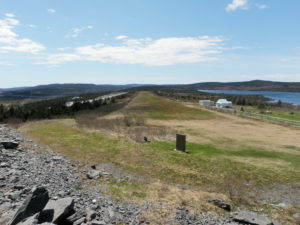 The airstrip was constructed through the financing of the 21 member committee, a grant from the Newfoundland Government, and with the help of T.A. 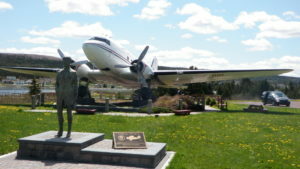 Hall (government engineer who was also involved in determining the location of the Gander Airport) and R.H.K. Cochius (available from the Highroads Commission for technical advice). The airstrip took only a month to build, and is located near Lady Lake, to the south of Harbour Grace. According to the crew of The Pride of Detroit, the airstrip was one of the finest they had ever seen. Mabel Boll, who was in Harbour Grace in an attempt to be the first woman to cross the Atlantic (Amelia Earhart left Trepassey on a successful flight two days after Boll’s arrival in Newfoundland), donated $500 to the president of the airport toward further development “of what was considered to be a thoroughly efficient airport service” (42). 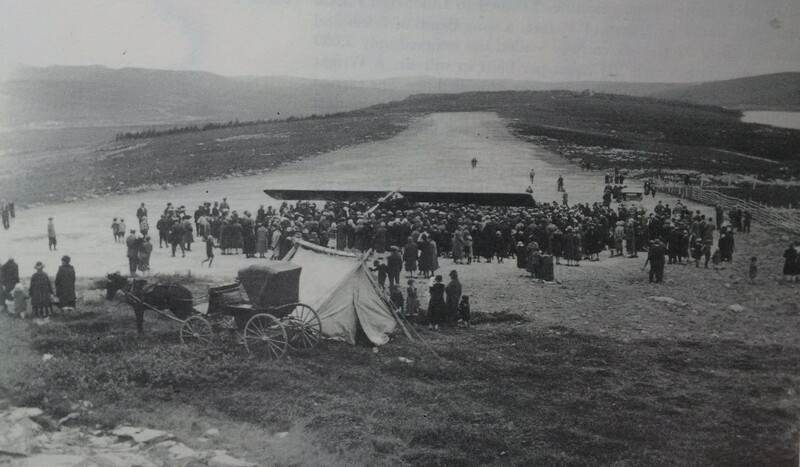 The Pride of Detroit, the first aircraft to use the Harbour Grace airstrip, landing on 26 August 1927. Parsons and Bowman 1983, 24. After the above history about the airstrip, the book focuses on the individual aviators (and aircraft) that passed through Harbour Grace. The histories talk about failed and successful trans-Atlantic crossing (sometimes attempts at around the world flights). In 1927 alone, some twenty trans-oceanic flyers had been lost leaving North America to cross the Atlantic (27). Each section talks about the aircraft, the aviators, and their fate as they leave Newfoundland (whether they were successful in their attempt, did not attempt and where they went after Harbour Grace), and other interesting notes of history. Inside this book is a great deal of information, coupled with beautiful and rare pictures. Wiley Post and Harold Gatty with the Winnie Mae in Harbour Grace on 23 June 1931. Parsons and Bowman 1983, 72. Wiley Post is a well-know Alberta aviator, and is prominently featured in the Alberta Aviation Museum. My biggest complaint with this book is the lack of captions on the pictures. I don’t know which pictures were taken by Bill and which were taken by Reuben. Of course, the years on the pictures would give a good indication, but cannot be credited with certainty. As well, some of the pictures have locations and people identified, and others don’t. Of course, there are many pictures that clearly show the name of the aircraft in the picture, or a recognisable face, such as Amelia Earhart, but captions also help give quick points of reference instead of always needing to read the associated article for details such as the aircraft, pilot (and crew), and date. The Spirit of Harbour Grace. Photo by author 2010.